Petra March has such a dreamlike quality to her writing that it's the perfect escapism from our dark and dismal lives (I speak for myself, of course). 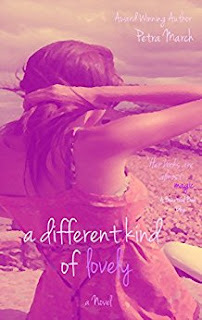 I was honoured to try my hand at editing and read an early draft of A Different Kind of Lovely but it was clear that the quality of Petra March's writing shone through every single page. Neal and Mina are broken in different ways, so it is natural that they would be drawn to one another. I loved how Neal referred to Mina as his butterfly, both may appear fragile and beautiful on the outside but they are tougher than you think underneath. What Mina didn't realise at first is how Neal managed to enter her life. It wasn't an accident that he was in that place at the time he met her, although it was a tragic accident that ultimately brought them together. I'm being deliberately vague as to get the most out of these books, you should really read them all in order. The characters are linked in such a way that it's so breathtaking to behold the hand of fate at work. I was delighted to see some of our favourite characters from the early books and it's like they have grown up in front of our eyes. I welcomed them as I would an old friend and felt as if I was hovering on the outskirts of their midst seeing events unfold. Heartbreaking, ethereal and dreamlike, A Different Kind of Lovely will awaken your senses and encourage you to hold on to your dreams. The strength shown by Mina's character was both uplifting and courageous and it just shows that a person can appear fragile and breakable on the outside but be so very strong and vigorous underneath, and vice versa of course. Do read these books in consecutive order to get the most out of them, it will really make a world of difference to understand the characters' history and see their development. Pure escapism with a dreamlike quality, open your heart to Petra March's ethereal writing and her exquisite characters.